Urgent because, if the coat meets approval, I will cut the tags and wear it to a meeting tonight. I had been planning to replace an old dress length black puffer that is at least 6 years old. I liked that this one from Michael Michael Kors is even lighter weight and packable, yet seems warm. I sized up so I could layer sweaters under it. It has a hood but it lays pretty flat. It had gold hardware, a plus for me. Most of my bags have gold hardwear. What do you think? I also have a whitish long puffer that is more fitted and a light grey jacket puffer. K/R? Looks good to me Joy! It looks great and seems to meet all of your needs, Keep! I like it a lot! The gold hardware is really stylish and I like that you can zip it at two different lengths. It looks good. Have you tried your gloves/mittens with the zippered pockets? I ask because I tend to snag mine, so avoid pockets with zippers. Thank you! I am feeling a bit more confident about this coat. Good questions, Sarah and Nemosmom. If I don’t need to layer anything heavy underneath, like shopping, I would probably wear the white coat. 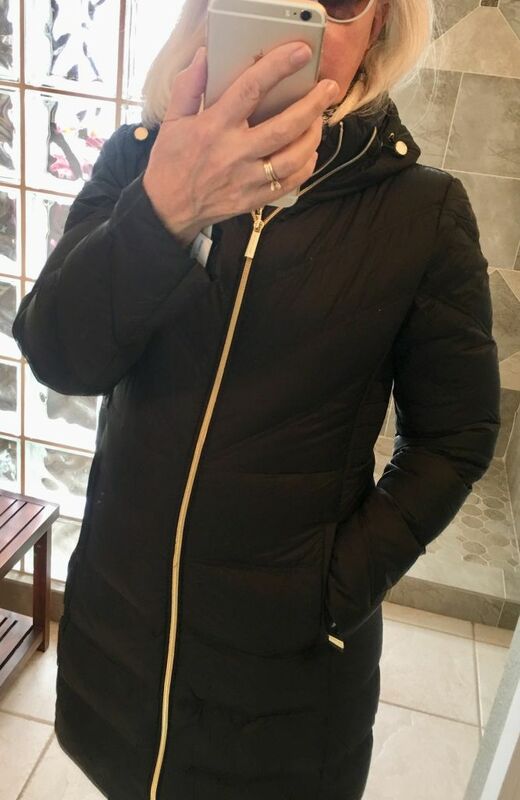 I wanted this coat for real cold like going to the mountains in winter as we will do next month, winter trips back to the frigid Midwest, sledding and snow fun with grandchildren, winter night parade and bird watching, winter hikes. I will have to try gloves with the pockets. My warmest are leather so probably will not snag. A YES from me. It is so hard to find a puff with gold so that is high marks right there. I love the length, overall fit, and that it is light weight. Yay! More puffer approval and Angie has spoken. Thank you! I am still beating myself up over not getting an orange puffer jacket at the Rack back in October or November. I thought it overwhelmed me but it was a work of art. I have this MK puffer with black hardwear ! I love the slim fit ! Thank you, bj1111 and Taylor. Yay, we are puffer "cousins". Taylor, is there anything about the coat that you don't like? I sort of wish there were faux fur on the hood but I also like the sleekness of it without. The hood actually fastens so that it would stay on in the wind. If you already feel like wearing it tonight, I say keep! More love for the jacket. Nice length. So nice and looks great on you. After years of always choosing the most traditional version of the most classic clothing I'm really appreciating the impact of the "little something" different details. Thank you, Taylor, Jill, sterling, pil, Isabel, and Lisa, for your comments. I did wear the coat this evening and noticed that it seems to be a very dark navy rather than black. So much the better. I do think the midnight navy is more you than the black. Mine is black, hence the black hardwear I’m guessing . This is a really nice coat on you! I'm glad you decided to keep it. ohh, I really do like that kind of v dark navy. Fab coat, glad you’ve cut the tags and worn! Glad the tags are off, Joy, I love the new puffer on you. Fit is great, and the gold hardware is lovely. Cut! Love the bright but subtle, graphic bling on a still elegant dark backgound-good for casual and dressed up, too! I have a similar MK lightweight down with silver zipper and snaps. I love it, it has been my main winter coat for at least 4 years now. It is surprisingly warm for the lightness of it. Glad you are keeping! Looks great and streamlined - which is a pretty amazing attribute for a puffer! Glad you kept it...looks great. Today was in the 40'sF. I wore the coat to meeting friend for coffee and shopping It was almost too warm. But I enjoyed how light it felt. Thank you all for your encouragement. The gold hardware makes it special and interesting. It's lovely Joy. Good call. Great zipper. Excellent choice! It looks great! !